Which TV shows are doing the best? The worst? Cancelled or renewed? Wondering how your favorite series are doing in the ratings? Here are the season average ratings of the 2015-16 network TV shows — through the end of week 31 (Sunday, April 24, 2016). ABC shows (so far): 20/20, America’s Funniest Home Videos, The Bachelor, Bachelor Live, Black-ish, Blood & Oil, Castle, The Catch, Dancing With The Stars, Dr. Ken, The Family, Fresh Off The Boat, Galavant, The Goldbergs, The Great Christmas Light Fight, The Great Holiday Baking Show, Grey’s Anatomy, How To Get Away With Murder, Last Man Standing, Marvel’s Agent Carter, Marvel’s Agents Of SHIELD, The Middle, Modern Family, The Muppets, My Diet Is Better Than Yours, Nashville, Of Kings And Prophets, Once Upon A Time, Primetime: What Would You Do?, The Real O’Neals, Quantico, Scandal, Shark Tank, and Wicked City. CBS shows this season (so far): 2 Broke Girls, 48 Hours, 60 Minutes, The Amazing Race, Angel From Hell, The Big Bang Theory, Blue Bloods, Code Black, Criminal Minds, Criminal Minds: Beyond Borders, CSI: Cyber, Elementary, The Good Wife, Hawaii Five-0, Life In Pieces, Limitless, Madam Secretary, Mom, NCIS, NCIS: Los Angeles, NCIS: New Orleans, The Odd Couple, Rush Hour, Scorpion, Supergirl, Survivor, and Undercover Boss. CW shows this season (so far): The 100, Arrow, Containment, Crazy Ex-Girlfriend, DC’s Legends of Tomorrow, The Flash, iZombie, Jane the Virgin, The Originals, Reign, Supernatural, and The Vampire Diaries. 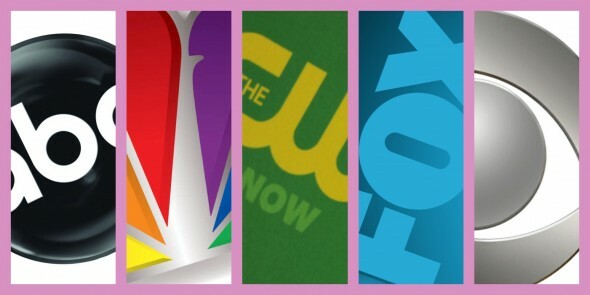 FOX shows this season (so far): American Grit, Bob’s Burgers, Bones, Bordertown, Brooklyn Nine-Nine, Cooper Barrett’s Guide to Surviving Life, Empire, Family Guy, Gotham, Grandfathered, The Grinder, Hell’s Kitchen, The Last Man On Earth, Lucifer, MasterChef Junior, Minority Report, New Girl, Rosewood, Scream Queens, Second Chance, The Simpsons, Sleepy Hollow, World’s Funniest, and The X-Files. NBC shows this season (so far): Blindspot, Best Time Ever With Neil Patrick Harris, The Biggest Loser, The Carmichael Show, Caught on Camera with Nick Cannon, Chicago PD, Chicago Fire, Chicago Med, Crowded, Dateline NBC, Game of Silence, Grimm, Heartbeat, Heroes Reborn, Law & Order: Special Victims Unit, Little Big Shots, The Mysteries of Laura, The Player, Shades of Blue, Strong, Superstore, Telenovela, Truth Be Told, Undateable, The Voice, and You, Me and the Apocalypse.